Authorities in Suffolk and Nassau said no injuries have been reported, but the thunderstorms also flooded streets, suspended LIRR service and trapped vehicles on local roads. A line of strong thunderstorms caused several house fires that cropped up quickly across Nassau County on Tuesday and was also blamed for other mayhem elsewhere on Long Island, authorities said. Firefighters battled weather-related blazes in Levittown, South Hempstead, Uniondale, Plainview and New Hyde Park, where a Long Island Rail Road power plant was likely struck by lightning, said James Hickman, head of fire investigations at the Nassau County fire marshal's office. The office confirmed Wednesday morning that all of Nassau's Tuesday night house fires had been caused by lightning. Authorities in Suffolk and Nassau said no injuries had been reported, but the storms flooded streets, suspended railroad service and trapped vehicles on local roads. The Long Island Rail Road had to suspend service on three branches due to a fire at a power substation in New Hyde Park that may have been caused by lightning, authorities said. Trains were canceled or delayed by up to two hours, the LIRR tweeted. On the other branches, all except the Port Washington reported weather-related signal problems that caused delays of up to 20 minutes, the railroad tweeted. 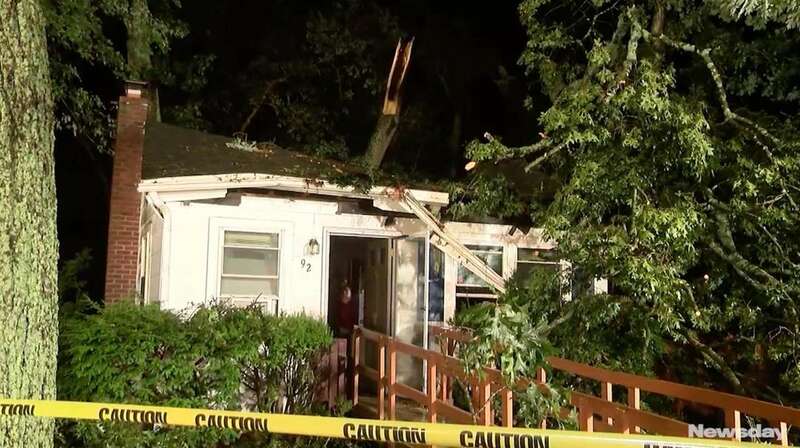 The storm sent a tree crashing into a Selden house, but no one was hurt, said Suffolk police, who also reported one house fire that may have been weather-related in Medford. A tree also fell in another yard in Selden. In Rockville Centre, six vehicles conked out at Long Beach Road and Merrick Road when they were flooded by rain water, a village spokeswoman said. Police responded, but motorists refused to leave their vehicles to step into deep water, she said, so a firefighting rescue truck arrived to transport them to drier land. Tow trucks pulled the vehicles out to clear the roadway, she said. 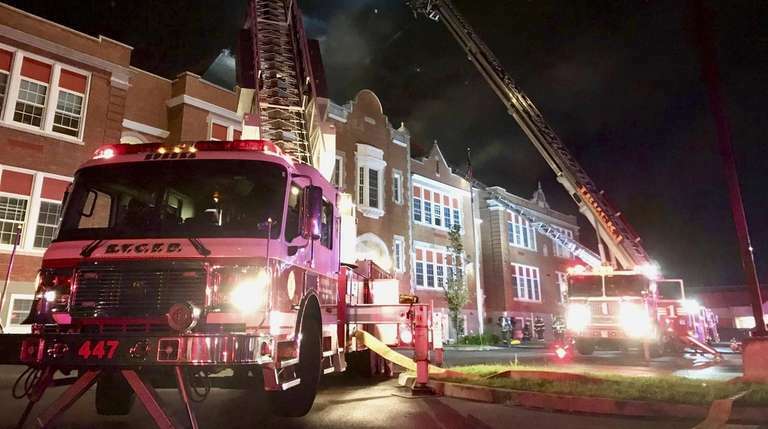 A fire also broke out at the Prospect elementary school on Peninsula Boulevard in Hempstead Tuesday night, though officials were not sure if it was weather-related. The extent of the damage was not known. Traffic in both directions along a quarter-mile stretch of the major artery was shut down for hours as a dozen fire trucks and emergency vehicles clogged the street. The National Weather Service in Upton reported lightning strikes, some flooding but no wind damage on Long Island from the storm. “There was more lightning than your average, run-of-the-mill thunderstorm,” meteorologist Pat Maloit said. He said the service received a report of a car that had become disabled due to flooding in Babylon, but no reports of wind damage Islandwide. “All of our damage was in New Jersey and Westchester County,” he said. The service issued a flash flood warning Tuesday night until 11:15 p.m. for areas of Long Island's South Shore, including parts of Hempstead, Freeport, West Babylon and Amityville. At one point, the PSEG LI outage map indicated there were more than 10,000 customers without power. Just before 10:30 p.m., the number was down to 8,090, the utility reported. The National Weather Service said the heat and humidity will continue Wednesday with showers and thunderstorms likely. Storms will roll in again Wednesday afternoon, with some containing heavy rain and gusty winds, the service said. Conditions are expected to clear Thursday as a cold front moves through with what the service said will be a "minimal drop" in humidity. State officials said an air quality alert was in effect until 11 p.m. Tuesday for both counties for elevated pollution levels that could be harmful to elderly and at-risk people.